Discover Your Depths is delighted to present its Human Potential Training specifically designed for Axia Futures. Our aim is to teach how a deeper understanding of an integrated approach to physical and mental training can reveal not only our untapped potential, but also a roadmap for how to fulfil it. This unique training targets both individual development of personal potential and mental capacity, but also essential life and workplace inter-personal skills such as compassion and trust, communication and collaboration. 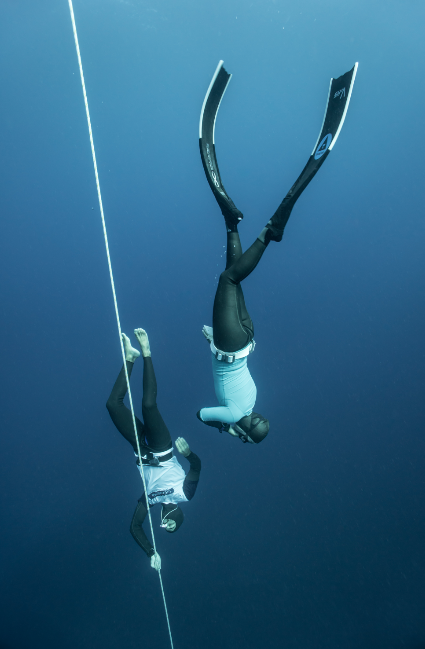 The Discover Your Depths coaching methodology is based on Sara Campbell’s experiences as one of the world’s top deep freedivers (four World Records, best performance 104m on one breath) and yoga and meditation teachers. She achieved her first three world records in world record time also - just nine months training from complete beginner to three-times champion, ruling in all three depth disciplines, obtained over three consecutive days, another ‘first’ in the sport. She did this by gaining mastery over her body and mind, and turning potential into performance. why is human potential TRAINING IMPORTANT FOR you? Each one of us already has the blueprint of our maximum potential within us, waiting, like a seed about to germinate. But it is up to each of us to create the right conditions for the seed to begin to grown, for our potential to unfold and flourish. The DYD Human Potential Training is designed to challenge your thought processes, your lifestyle, your beliefs around potential and performance, in a way that no other personal development training can achieve. Working with breathhold you will uncover your subconscious fears and motivations. You will see clearly how they are sabotaging, rather than supporting you. Descending into the depths of the ocean you will receive a completely neutral and honest - but often challenging and confronting - reflection of your true mental and physical state. Can you accept the truth? Can you rise to the challenge to really go deep inside to reveal your potential? Can you remain truly calm under pressure? Breathhold diving - freediving - awakens an ancient, innate wisdom held deep within our genetic coding, that of the Mammalian Dive Reflex. This reflex means that we can survive submerged in water, without breath, for much longer that we believe should be possible. Our bodies are designed to be in water. Through this process we learn to connect with and begin to trust, a deeper wisdom, beyond our intellect, which can guide and sustain us. It is the perfect antidote to our modern lives. In daily life we are taught to subject ourselves to the laws of societies, economies, governments, family systems, and business performance. But rarely do we adhere to or even acknowledge the laws of Nature, the laws that govern our heart beat, our breath, our entire physical and mental being. We are brought up in a world that prizes intellect above wisdom, physical strength above courage to defend the truth, and material wealth above the true riches of health, happiness and peace of mind. In this modern environment where material gain is everything, it is all too easy to lose our selves in the competition of constantly trying to be ‘more’; more money, more power, more success, more fame… But this will never be enough because they are human constructs and concepts and as such are not really real. In times of inflation, how much money will ever be enough? When the oceans are too toxic to hold any life, and the rainforests burned to the ground, how will your fame serve you then? When you face challenges beyond your intellectual capacity, how will you not only survive, but thrive? Freediving reconnects us directly back to the true laws that should guide us - those of our physiology, our biology, our mental capacity. We relearn our place on this planet and as such learn a new way of nourishing ourselves physically and mentally, to create sustainable and enduring success and grow into our true potential. What is human potential training? The first level of training encompasses five days of training in Dahab. In groups of maximum two students you will work directly with Sara, supported by at least one other coach, as you are guided each morning through a programme of lectures and exercises, and are invited to perceive yourself in a new way, both in relation to society and in relation to your current image of self. The afternoons are structured around putting this theory into practice - breathholds in and out of the water, working through skills for depth progression, observing how your mind operates under stress, and using these experiences as a unique opportunity for self-reflection and the starting point for personal transformation and unfolding of potential. Level two, available from 2020, will work with larger groups, with students who have completed level one and are competent enough to start to provide safety for each other and work more closely in buddy teams, for training, support and co-coaching. Level two will go beyond the individual benefits of Human Potential Training, into collaborative behaviours, communication, team-work and inter-personal relationships. You will find all available courses listed in the dropdown menu below. Please select your chosen training dates, and click to pay your deposit to secure your place. You balance will be due one month before your chosen training date. We will contact you then with a link to pay your deposit, along with important paperwork which must read, print and bring with you. For any questions or enquiries, please do not hesitate to email us to discuss your specific requirements or any questions or concerns you may have. We are always happy to design bespoke programmes if you feel that you would like to explore this method of personal development more ‘deeply’, or you might want to look at our Private Coaching or Distance Coaching options.